Lord we lift Your Name on high! 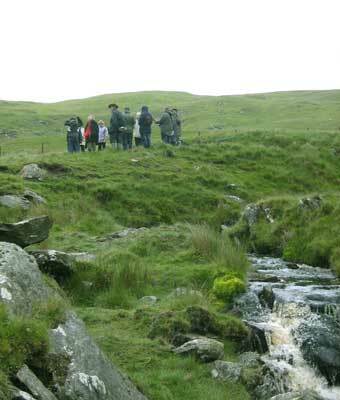 Last Saturday we met in the Cambrian Mountains for a time of prayer with a small group of intercessors. Coming from different parts of Wales and the west of England, we hiked up through farms and fields in the rain to Wales' geographical mid-point on the slopes near Cymystwyth. Friends of ours had organized this special time of praise and worship, directed prayers, and prophetic declarations over the land. Just below where we were gathered, two streams joined together and then continue their journey downwards where they are joined by many other streams. These eventually pour into a river that empties into the Irish Sea. During the gathering I became aware of how we, members all of the Body of Christ from different "streams" were brought together in Him through a common heart to see Jesus' name lifted up over Wales. I believe that as more and more saints are brought together in different events to cry out for His Kingdom to come, the time draws closer for the awaited outpouring. As a token of our intercession having reached the target, toward the end of our activity the sky brightened up considerably and we briefly saw glimpses of blue sky! "And all the people went up after him; and the people played the flutes and rejoiced with great joy, so that the earth seemed to split with their sound." This happened following Solomon's being annointed king. But what a glorious picture of when the Lordship of Jesus is publicly declared over all of Wales! How we long for the "earth seem to split with the sound" of outpourings of praise and worship throughout these hills and valleys as never before! You can see a short video clip of the worship on YouTube at this link. Also you can read a more specifics about what went on at Wales Awake! archives..
Also, thank you to all those that prayed for Grace! Her interview went well but she still has not heard back, so another little prayer on her behalf would still be appreciated! Thirty years of blessings . . . 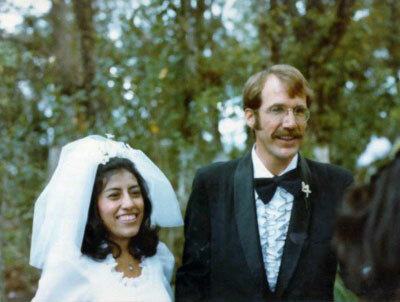 Yesterday Gladys and I celebrated our 30th wedding anniversary! We are so thankful to the Lord for his faithfulness through the years, and are overwhelmed at the extent of His blessings in so many areas in our lives and the lives of our four children as well. We also were remembering so many people we've met along the Way whose lives have blessed ours, and hopefully we have blessed too. And as we remembered, our hearts filled with prayers for them and their continued faithfulness to and love for Jesus. In this same way now we find ourselves with so many dear friends and fellow saints here whose hearts also cry out for God's move. We are just so very blessed to be able to love and serve and encourage as many as the Lord puts in our path, and together we are fanning into flame the coals burning in the hearts of God's people. While walking yesterday afternoon along part of the Pembrokeshire Coastal Path we were talking and marveling at how God's goodness has been with us, and how we could never ever have imagined living where we are now. We know that He has ordered our steps, and made possible this extraordinary privilege to be set apart to pray here in Wales for His coming move in this nation. While reading Solomon's prayer of dedication of the temple in 1 Kings 8, I was struck by the following phrase in verse 47, "yet when they come to themselves in the land where they were carried captive, and repent, and make supplication to You in the land of those who took them captive, saying, 'We have sinned and done wrong, we have committed wickedness'". That seems to be a key to what we are praying for - that people would "come to themselves" and realize that without Jesus they are without hope in this world. (Actually there are several powerful expressions of prayer here and I recommend you read this chapter carefully.) One hundred years ago Wales experienced an enormous visitation of the Spirit of God with world-wide repercussions, but now the people are so far removed from that experience, and they need to "come to themselves" - to see themselves as they truly are, as God sees them. Also verse 38 says "when each one knows the plague of his own heart.." This too can only come through the working of the Holy Spirit to bring conviction to their lives and cause them to look to Him and be saved. Thank you for praying with us through these scriptures. Summer days are growing longer, and we've been having some wonderful sunsets over the river valley from our house. I took this picture at 9:30 tonight! 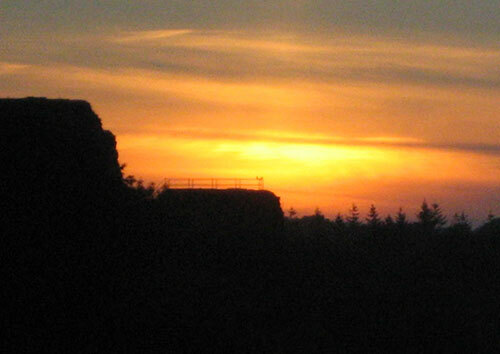 During the last few weeks I've noticed a pair of crows that perch on the handrail of one of the castle towers at this time of the evening, and they seem as enthralled watching the sunsets as we are! As I was observing them there tonight it appeared as if they too were admiring God's glory, and I almost felt as if they are praying for revival too! I know this may sound a bit strange, but the scriptures say in Romans 8:19, "The (whole of) creation waits in eager expectation for the sons of God to be revealed." These crows are certainly part of creation, and so they must be looking and longing like the Word says. This afternoon we were praying outside the chapel in the cemetery, and were sharing with Gladys how our greatest desire is to see people be made aware of God's glory and His amazing love for mankind. The myriads of wild flowers that abound everywhere now are just one blazing example infinite love and attention to be auty and minute detail. There is just so much of the goodness of God inherent in our very existence, and yet people totally ignore the fact. It is as if each one of the zillions of tiny flowers everywhere are all crying out, "Look! Look at me! Doesn't my beauty prove to you that God our Maker and is real and He loves you? Isn't the fact that you can even see me prove it's true?" So we join our hearts to the cry of the natural world, in earnest longing and expectation for the sons of God to be revealed. After all, this must indeed be the essence of revival - the awakening of the souls of the multitudes to the glorious fact that we are specifically created and dearly loved by He who has provided us eternal life and redemption. "Yet to all who received him, to those who believed in his name, he gave the right to become children of God," John 1:12. Thank you for praying with us for revelation, repentance and redemption for the people of Wales and the world.